This post is long overdue. 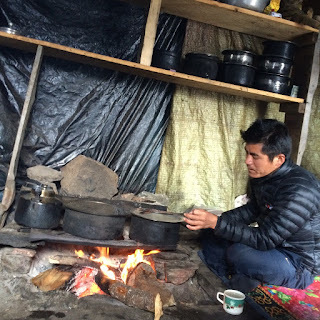 I visited Laya in April and I have been meaning to write about it for such a long time. But somehow, I couldn’t. It seems absurd that my excitement of it did not burst beyond the normal routine that ate up my time. 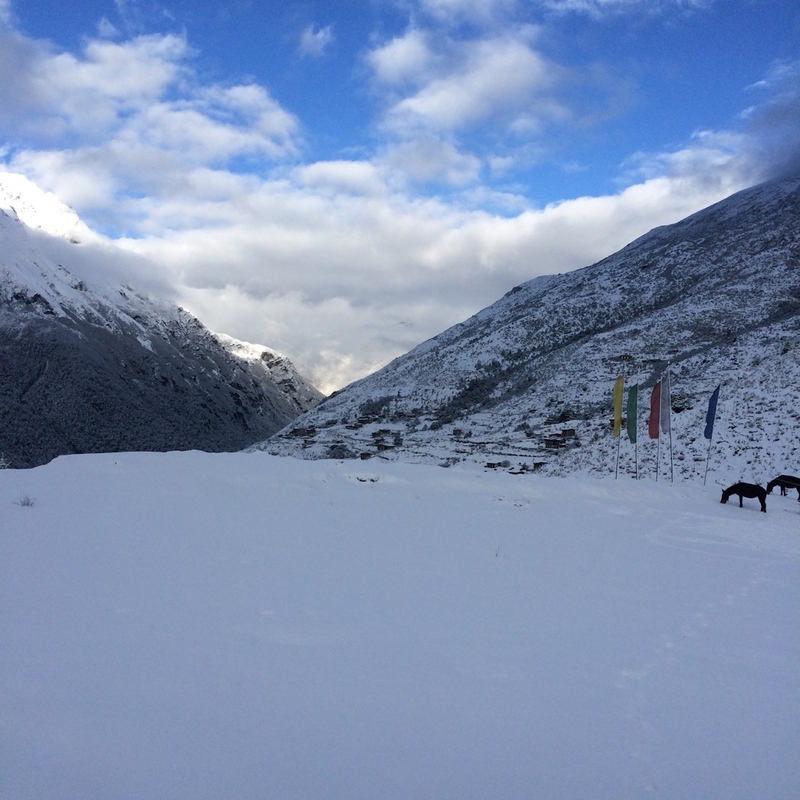 We were in Gasa district towards the end of March. 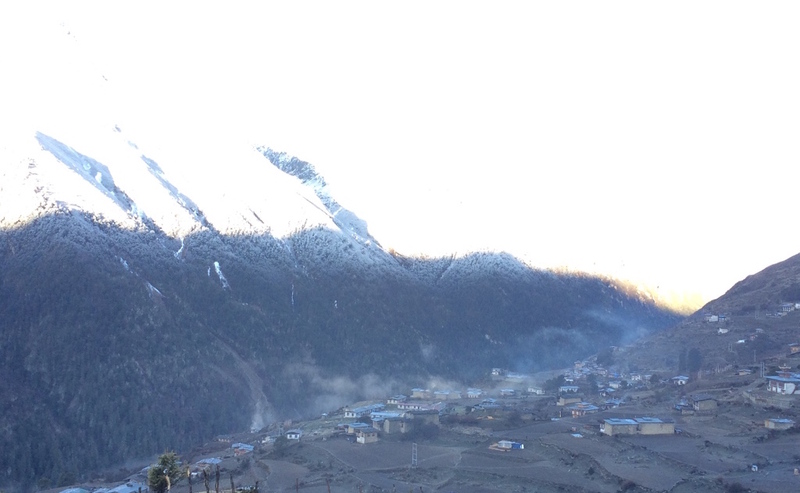 The Layaps move to Gasa to escape the harsh winter in Laya and settle there for a few months – also witnessing the annual Gasa Tshechu. Towards April, most of them go back. It was because of this coincidence that my survey team could contact many of the respondents’ household in Gasa and only five of us had to go to Laya to interview those households who had already returned. We teamed up with the election commission’s team that was going to Laya to conduct the election of Tshogpa. However, we gave up the hope to get to Laya on the same day like them. We took eight hours to reach a place called Koina (originally called the Ku nye sa – the place to take rest – it is at this place that Zhabdrung Ngawang Namgyal took rest on his way to Bhutan from Tibet. There is a chair like stone near the river where Zhabdrung rested). The government of Bhutan has constructed a small one storeyed guesthouse at this place run by a government paid caretaker. Everyone moving between Laya and Gasa take rest here – while some stop only for lunch or tea and snacks, others like us stop to halt a night. The caretaker is from Laya and he was in RBA. His wife is from Tsho Tshalo in Samdrup Jongkhar and they make quite a home there for the travellers. Despite our tiredness, our mood lightened up and felt doubly welcomed when we were joined by a group of Layaps – among whom two were our respondents from the previous day. Quite naturally, we felt akin to them and we shared the resources for dinner – in fact, it was them who gave us their ration, including cheese, which is a rare specialty when we have to travel on a long journey. The guesthouse had enough blankets to fight the cold and we had a good night. The next morning, we left at 8 a.m. and reached Laya at around 4 p.m. By the regular traveller’s standard, we had walked at a snail’s pace but we were quite happy we made it. We packed lunch and ate on the way by a stream, sitting in the light drizzle. We hardly enjoyed the lunch but we had to eat to keep ourselves strong for the journey. 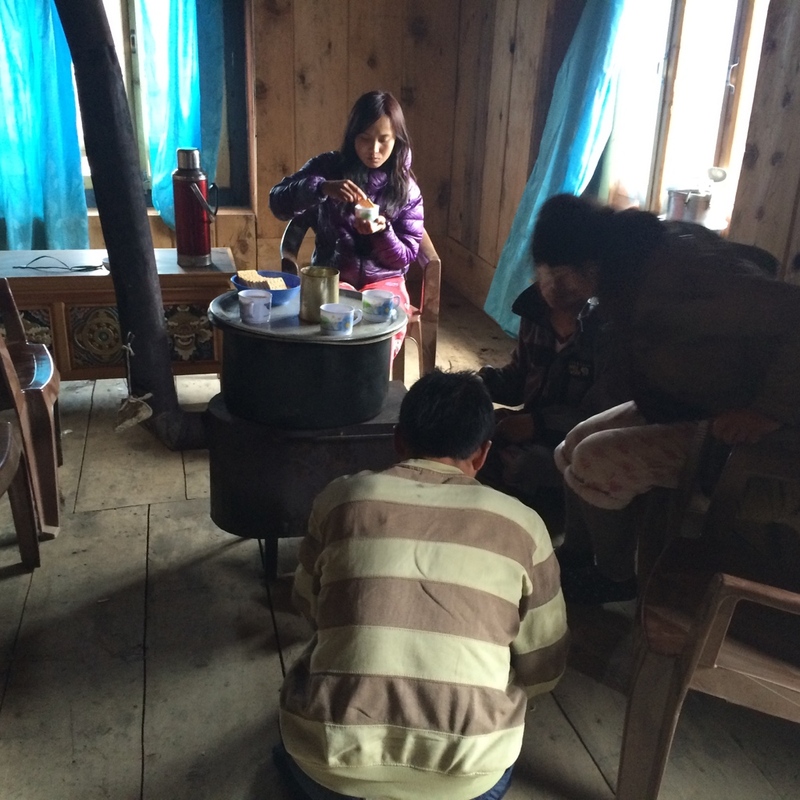 We were served tea by the RBA stationed before reaching Laya called the Tashi Makhang. Those of you who are travelling to Laya for the first time must be aware that you need a letter (called the pass) and you have to show it to the person on duty at this army camp. After two days, it is at this place that you get the mobile signal. All of us called home to inform that we had no problem on the journey and would be reaching Laya in two hours. In reality, we took longer and before we reached the village, it started to snow and we stepped into our destination cold and unsure of what the tomorrow would be like. But, the Gewog ADM, who happened to be related to me through marriage, was very kind and arranged everything for us. The second morning greeted us with a blanket of snow around us. We all felt jubilant by the sight and we went on with our work despite the difficulty it posed for us. After two days in Laya, we went to Lugo, two hours walk from Laya village. We put up with our respondent we met in Koina called Aum Pego. She is by nature talkative and opens up easily and that is why we felt comfortable with her from the start. All of us put up at her house in Lugo and while there, we also went to her sister in-law’s house who treated us with tea and gave us chugo (dried cheese) on parting. What will surprise you is their hospitality and the resources. They have packed rice, blankets, mattresses and grocery items stacked up against the wall to the ceiling. They surely would survive in the times of calamity. Aum Pego had sought help from one of the teachers (Dzongkha teacher) from her community school to prepare dinner and breakfast for us. They had also packed our lunch for the day’s journey. The house is usually not partitioned and all of us slept in a line in the room. She is two years younger to me but has three children already and seems strong and hardened by life. At dinner, what I noticed was that, contrary to her, her husband is quiet and sits next to her without much to add, while she talks almost exuberantly and flirtatiously to the teacher who had come to help prepare our dinner. She told us that he usually helps her household in cooking during the times of annual rimdro and other big gatherings. What I would like to add is that, before you interact with them, you would feel that you are different from them, and as you come to know them, you will be surprised by how similar we all are. As humans, all of us have the same basic needs, and the same human values trigger the most humble and honest emotions. If not for their hospitality, friendliness and generosity, we would have enjoyed half our time there. I can't contain my happiness right now. I feel like I am finally seeing better days coming my way. 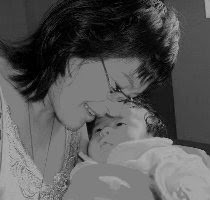 When I was expecting Dechen, my daughter who will be five years old in just four days, there was discussion of maternity leave being extended to four months from the existing three months. I looked forward to it with fervent hope, my expectation overriding the reality. And then, it didn't happen. 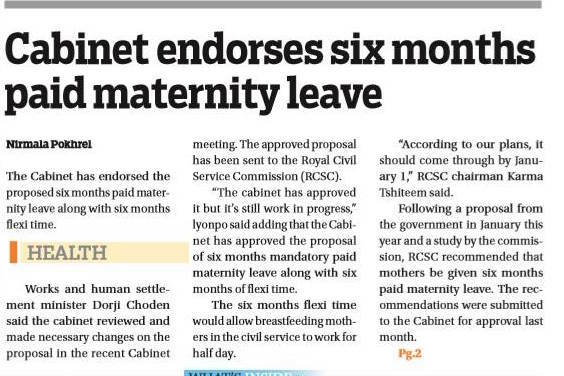 But this time, I am going to be a beneficiary of the six months mandatory paid maternity leave and the six months flexi time. My baby could not have come to me at a better time. This makes me feel that he/she is lucky -- despite the Bhutanese's belief of the coming year not being the best one. I have never believed in it so much anyway--will the year we are born in determine who we become? I don't think it will. Anyway, I am not here to justify that my baby is going to be the lucky one despite his/her zodiac sign. I am here today to thank the government, policy makers and the stakeholders who had input in finally endorsing the extension of maternity leave. A working mother like me welcomes nothing better than this news. The organisation I work for has the norm of changing administrative officer on rotation basis. The turn came to me for the 2015-2016 Financial Year. When it was decided that I would be looking after the AFD for this financial year, I didn't say no -- not because I had wanted to be an ADM but because to say no would be disobedience to the head of my organisation. And so here I am. ADM for a year. Unlike other offices, it should be relatively easier for me because we are only 32 staff, including ESP. But it is quite a different experience altogether. You have to worry about all the nitty gritty things such as not having water in the toilet to the administration of the staff. You become more a logistic manager for the office and it is not such an easy job. For now, I am trying to take it positively because all of us have to be managers at this age after being in job for 10 years or more. I now understand what my Dasho meant when he told us that he sometimes woke up in the middle of the night and remembered things that we had left pending and he couldn't fall back to sleep. It happens to me sometimes. I have to then start noting them down in my mobile phone notepad so that I don't forget them the next day. As administrative officer, you have to work with Royal Civil Service Commission a lot and so far, I have tried my best to do what I have to on time and I have submitted all documents they have asked without delay. Sometimes you would wonder on the number of letters you receive from them, but you console yourself saying, if it can task you like that to deal with just one organisation, how much harder it would be for them that has to deal with all the government organisations. And I am here to comply. I appreciate them for accepting the documents by email -- making it easier for me and saving lot of man times and fuel. (I would urge all the organisations to do that). Anyway, I am late in the office right now -- and it is because I am an ADM. I have come to appreciate administrative officers a lot better and I know what a tedious, tiresome job it is. It is not that demanding on your intellectual but I don't really enjoy seeing papers piling on my table. If you have thought being manager/administrative officer is a cup of cake, you better think again. It mostly needs soft skills and they don't come at a go. //This note is written feeling a little tired over the number of negotiations I had to go through for some work. I got late to office today. 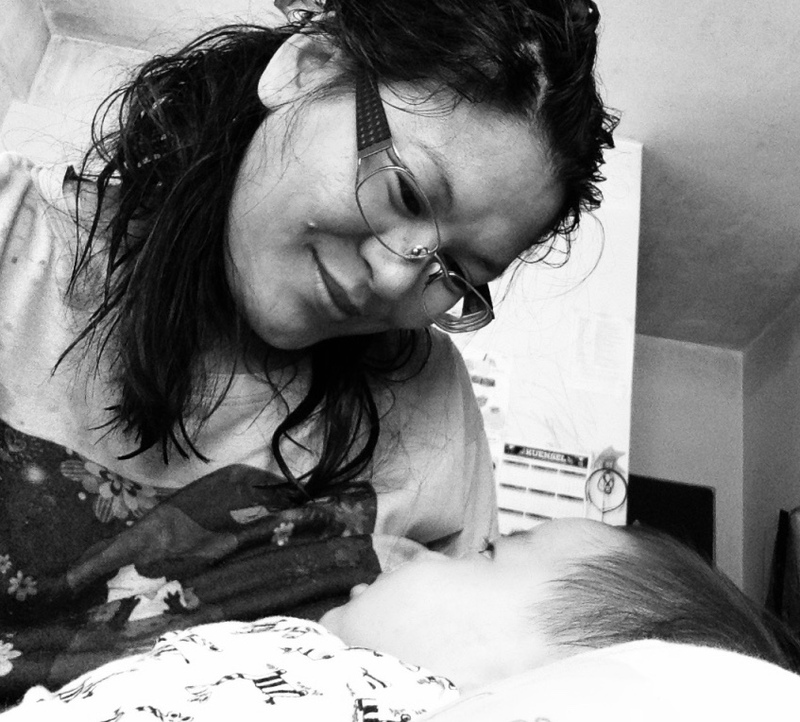 As I parked my car and got out, it was 9:45 a.m. Now, being a mother isn’t a cup of tea. I console myself saying that my parents lived in a more difficult time and therefore, they went through more hardship – which means, what I go through now is nothing. But does that work? Rarely. I got late because when I dropped my four-year-old daughter to her daycare, her principal asked me and all other parents to come inside their school to look at their first term progress report. I went to my daughter’s class, her hand clasped in mine. She started bending her head left and right, showing that coy behavior that she wasn’t so willing to go with rest of the children to the assembly. Her daycare has introduced a parrot green tracksuit as uniform for the children. My daughter doesn’t want to wear it to school. Today, she put them in her bag saying she was going to take help from her teacher, Madam Pasang to wear it once she was at school. Now, as I stood in her classroom, waiting for her madam to show me her progress report, she told me that she would like me to help her put on the uniform – and I did. Slowly, she began to nag. At first she wanted to give me a kiss, which she did. Then she wanted me to watch her say her morning prayer at the assembly. She said, ‘mummy jang rab ze yithro phiwa goth pa lek la’. I said I will. Now, maybe I yielded too much. She then said she wanted to go home. She didn’t want to stay at school today. I explained, reasoned, and told every little thing I could to let her see that being in school is more interesting than being home. This only made her cry, clinging on me. But she was not the only child who wanted to go home. There was another boy her age doing the same. There was yet another boy crying quietly inside the classroom. When no explanation worked, her principal came and took her off from me. It had to be forceful. She screamed and cried and fought to let her off. Once she was locked inside the altar room with other children where they were gathered to say the morning prayer and national anthem, I could hear her shout, ‘Nga chhi na jo ni’ – (I want to go home!) at the top of her voice. I faltered wondering if I should give in. I called my husband. He said I should leave her at school because she has to know that she can’t just have everything her way. I asked my husband’s sister who is home to go out and see if she was playing as usual in the school playground in a while. A mother’s heart burst into pieces hundred times everyday. There is a dilemma of such kind in each small activity. The routine of making children brush. The discipline of making them not watch TV while they eat. The routine of making them sit and eat in the manner they should. The list goes on. And no matter how helpful your husband is, the major chunk of the responsibilities fall on the mother. And mothers usually don’t complain. Do they? Children also prefer to nag mothers more. And you know what makes it worse? Just as I parked my car and came out, my boss came. The two times I had to go home at 4 p.m., I met him on the way. I keep bumping into him when I reach office late, or leave office early. It nags me because bosses do not always see deeper than these minor irregularities. And I feel like I should resign. Would there then be more peace? Would there be a better place for me? There was not a single doubt in my mind that I had found my soul mate. The most important thing was that he made me feel beautiful, and completely at ease. And of course, not all things last. This changed. Suddenly. And I was left with no consolation. I had no friends, and no relatives to seek help from. I fell for a person with the sweetest words. I cried day and night. At that moment, I felt more shocked than betrayed. I couldn’t believe that a person can utter love without feeling the tiniest of flutter in his heart. I wondered, ‘did he need practicing it many times to lure women to his arms and then leave them heartbroken?’ I was dismayed over the fact that a person can be this heartless. Over the fact that a person can find no better way to earn a living than to lure women into matrimony, rob them off their valuables and then leave them helpless. But I believe women are stronger than men. If they have the guts to cheat on them, betray them, or rob them, women have the power to come back. I also wondered if I appeared gullible to him. I am not a girl who hangs out late. Knowing myself well, I had no one to blame but my fate. Right now, all I tell myself is that I am unlucky in love. On the other hand, I am grateful that he left me before I was pregnant. I always believed that love could never turn to hatred but at the moment, having gone through the unbelievable twist of fate, if I had to see a face that resembled him on my lap everyday, I feel I would hate the world itself. Anyway, I went back to being single from married. And because he disappeared before I could introduce him to my friends and family, I was spared many questions. I am recovering from shock and sadness at his behavior and I am beginning life anew.